FESPA is a global federation of printing professionals based in 37 different countries for the screen printing, digital and textile printing community. Since 1962, FESPA has been organising the leading exhibitions and conferences for the print industry. At exhibitions, FESPA is eager to educate their membership by inviting industry experts to answer any questions they might have about latest industry trends. All FESPA staff must be easily recognisable whilst they’re at these very well attended and busy exhibitions. They required various branded T-Shirts for different events – FESPA Digital 2014, FESPA Fabric 2014 and Sign Expo 2014. The organisation opted for a printed T-Shirt so their staff would be easily recognisable and the T-Shirts would also point out the wearer’s field of expertise. FESPA required all T-Shirts to have both front and back printed and each T-Shirt must be printed with the event’s sponsors. As the T-Shirts were mainly white and each event requiring a different design, we decided that Direct To Garment printing would be perfect as it allowed us the freedom to input the design into a computer and the automatic machinery would do the rest. “We were very happy with the order,” says Balwinder Tank from FESPA. 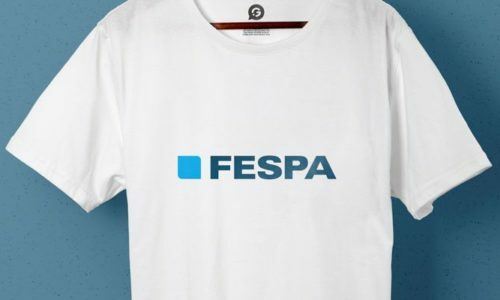 As it turns out, FESPA was so happy with the results that only a few days after the initial order, they approached Garment Printing again for the printing of five winning designs of a T-Shirt design competition FESPA fabric had organised!